This Tips for Tutors part of the site is full of information for homework helpers, parents, and education professionals. Here, I provide a rich resource for those who want to improve their skills. 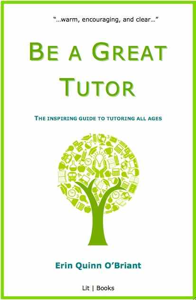 For everything you need to tutor successfully, click to more about my book, BE A GREAT TUTOR. Good guidance is crucial to successful sessions, so take the time to educate yourself. Click the links below for information on one-on-one education techniques, great jobs, and starting a tutoring business. Browse through other parts of the site, too. I’ve provided a lot of information for students and parents who need help. Look at tutoring through their eyes to see how you can serve them better. I love tutoring so much, I wrote a book about it! It's my pleasure to share all kinds of tips, tricks, and strategies with other tutors. Start with the links below and on the navigation bar to get started. Here's to your success. Need work? Expert advice on finding tutoring jobs. Insider techniques for successful one-on-one sessions. Education books: Add YOUR review, read others' here. Share YOUR tutoring success stories and tips for tutors here! Discover some of my favorite tutoring strategies. Need classroom teaching info? Visit Priceless-Teaching-Strategies.com Priceless Teaching Strategies provides hundreds of teaching strategies for elementary school teachers on topics such as classroom management, student motivation, teacher to parent communication, classroom games and so much more. Want more? This is just a fraction of the information in my book, Be a Great Tutor: The Inspiring Guide to Tutoring All Ages..
Get in in paperback or Kindle versions now!